In order to be legally valid a will has to conform to certain standards and include certain elements. These can be as simple as ensuring that the testator (the individual making the will) has signed the document correctly and that they have revoked all previous wills and testaments that they have made but, regardless of their simplicity, they must be completed in order for the will to be permissible. If these conditions have not been met, then the will can be challenged in court. The most common reasons for a challenge to the validity of a will focus on the role of the witnesses. One of the most basic elements of a will is the signatures. The will must be signed by the testator, but also by two witnesses. The concept of witnessing is designed to ensure that the testator has not been co-opted into signing the document, as well as to safeguard against the possibility of the will having being created without the knowledge of the individual whose estate is in question. When choosing witnesses for your own will you should, therefore, ensure that they are individuals who you trust, and can be demonstrated to have been close to you. However, becoming a witness precludes the individual in question from also being a beneficiary, which can pose problems when a testator is choosing who to nominate. This is an important point to note, and one whose oversight can lead to significant problems. If it is found that one of the witnesses is also a beneficiary, either directly (through the testator bequeathing a portion of their estate) or indirectly (through, for example, the creation of a trust from which the witness could benefit) then the will is still valid, with the exception of the instructions regarding that witness. In this way, the witness will no longer be permitted to benefit, and the portion of the estate which had been bequeathed to them will be added to the residue (what is left of the estate). There are other fairly strict rules regarding the circumstances in which witnesses must perform their duties. The most important of these is that their signatures must be added to the document on the same occasion as that of the testator; in this way, they give a guarantee that the testator has given their signature of their own free will. Furthermore, both witnesses must sign the document together; if this has not happened, then the entire document is considered void. 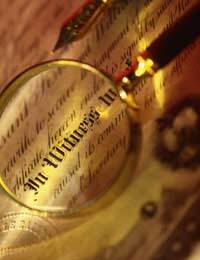 The role of the witnesses is vital to the validity of a will. As such, their duties must be treated seriously. They are meant as a legal safeguard and, therefore, if you suspect that their responsibilities have not been discharged properly, you may be able to make a legal challenge against the will. This can be a difficult process and, if you are seriously considering it, you should seek professional legal advice before going any further. This topic is covered in more detail in an article entitled “Appealing Against A Will”, which can be found elsewhere on this site. Can my son’s girlfriend witness my will in Nevada? They live together. We are UK based so can't advise on US laws unfortunately. Can my son’s girlfriend witness my will in Nevada?They live together. What happens if the executor is also one of the witnesses to a will? Does the witness to a will have to be a US citizen? Does a witness become an "interested party" if his wife is a beneficiary in the will? If yes, does he still qualify to sign as witness?